Cardiff University’s drama society, Act One, have outdone themselves once again. Normally I would attempt to keep readers on their toes and reveal my verdict at the end of a review, but having been inspired by the topic of the show itself, I feel there’s no need to have a ‘little voice’ about it. This is a show to shout about! 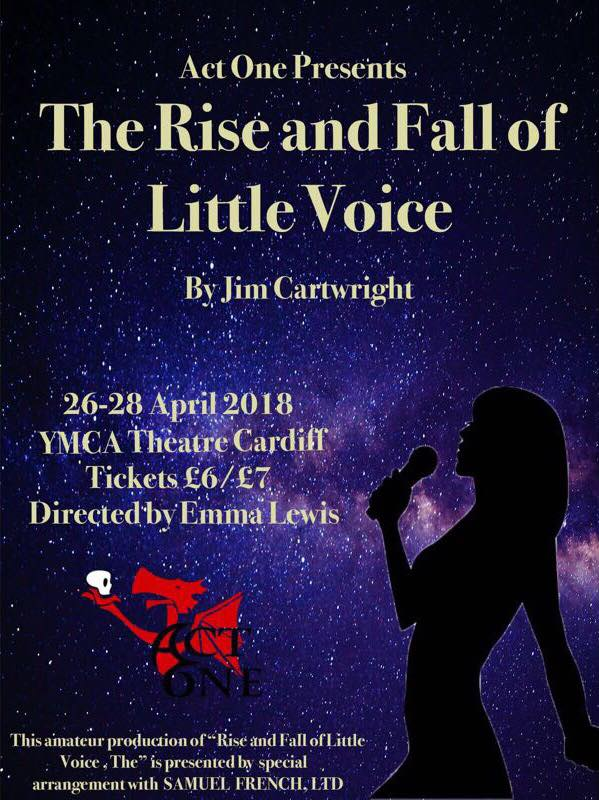 The Rise and Fall of Little Voice by Jim Cartwright, performed at the YMCA Theatre last weekend to raise money for Women’s Aid, explores a wide variety of emotionally-charged social themes, primarily class and domestic violence. With such a heavy plot that includes the exploitation of a vulnerable person, physical abuse and alcoholism, I was not expecting what unfolded before me. The first half of the show I found surprisingly amusing and at times, very comedic. This may sound distasteful considering the subject matter, but with a play like this, respectfully-timed comic relief is almost imperative to draw the audience in and amplify the themes. The three actors who did this with class and professionalism were undoubtedly Sarah Bulmer, as Mari Hoff, Kane Malone, as Mr Boo, and Sophie Callery, as Sadie. Callery had us all laughing every time she entered the stage with her graceless movements and hilarious facial expressions. Reminding me of the great Charlie Chaplin, hardly a word was spoken but enough was expressed in every other way as to keep the audience creasing up. Esther Morris, as Little Voice, sent thrills of delight through the audience with her dynamite vocal chords, and Malone kept us all entertained with his charismatic stage presence. With all the buzz of the first half, the second half of the show really knocked the audience off balance as the tone changed into something far more complex and emotional. Praise should certainly be given to the phenomenal production team who did a tasteful job of handling a sensitive topic whilst balancing the drama and the humour within the script. James Aitken as Ray Say came into his own in the second half, as he showcased his acting abilities in a soul-crushing outburst that takes place after his character realises he has destroyed his opportunity to escape his lower-class status and rough surroundings. This is a dream that each of the characters share, escaping the life in which they live, and it is the crushing disappointment and violence that result from their thwarted ambitions that truly left a chilling mark on the mind of the audience for days afterwards. Mari Hoff committed so completely to her role that it will probably be impossible for me to see anyone else play Sarah Bulmer in the future. Her ability to make us laugh and cry in equal measure is a testament to her talent, and I am eager to see what she does in the future. The set was fantastic, Jack Bridges and Dan Gammond did a great job with such a small space and low budget. It must be said that everything, from the set, cast, production and crew, worked so harmoniously that this team have set a much higher standard for all ‘amateur’ productions out there. Production managers, Byron Jones and Owen Strawbridge, and director Emma Lewis should be immensely proud of their efforts- they certainly paid off.